Disclosure: This is a sponsored post but all thoughts and opinions are my own. Solo: A Star Wars story is now out on Digital HD, and Blu-Ray combo pack! To celebrate, my family and I got equipped with some epic Solo merch for the ultimate Solo movie night! Our epic Solo movie night consisted of the Blu-Ray and it’s amazing bonus features (more on that later in this post), and some amazing Hasbro toys (from left to right): Star Wars Ultimate Co-Pilot Chewie, the Star Wars Force Link 2.0 Mission on Vandor Figure-4 pack, Solo Monopoly, Star Wars: Han Solo Card Game, and my daughter’s favorite, the Chewbacca Electronic Mask. 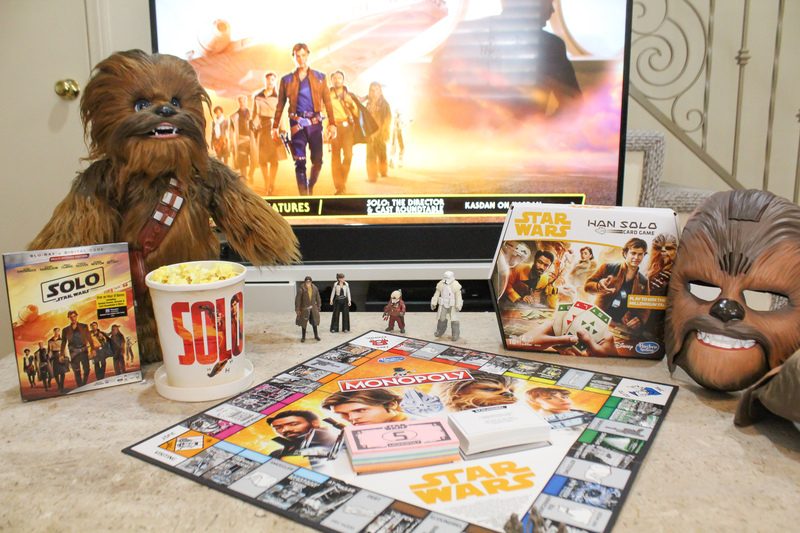 It was fun to make a whole evening of family fun with the masks, games, cozy Chewie blanket & pillow, and using our new talking Chewie while watching Solo: A Star Wars Story! It was the perfect way to spend quality time together that focused on one of dad’s favorite things in the world: Star Wars! Solo: A Star Wars Story proves as an excellent example of what the new saga could look like: a fun, genre-loving film with humor and a lot of charm. Set several years before A New Hope, Solo follows a young Han Solo (Alden Ehrenreich), who escapes his crime-ridden planet by joining the Empire with dreams of becoming a pilot. Those aspirations are dashed by the unfeeling government, but he soon finds a small team of thieves (led by the swaggering Tobias Beckett, played by Woody Harrelson) and eagerly joins them on their next big score. But when the job goes awry, thanks to the pirate Enfys Nest, Solo and his new team must pull off an even deadlier heist or face the wrath of their employer, the ruthless crime lord, Dryden Vos (Paul Bettany). Along the way, Solo finds a new brother-in-arms in the escapes Wookiee slave Chewbacca (Joonas Suotamo), recruits the charming gambler Lando Calrissian (Donald Glover), and meets the ship of his dreams, the Millennium Falcon. Solo creates a fast-paced, fun space western for the franchise, fully embracing the humor of Han Solo, while opening the world wider for examination. Delving into the dark, crime-filled underbelly of the Star Wars universe, Solo explores the moral ambiguity of the world, which previously was often divided between a resolute dark side and light side. Team Chewie: See what it takes to bring Chewbacca to life! Kasdan on Kasdan: Screenwriters Lawrence and Jonathon Kasdan talk about creating the film’s script. My personal favorites were the director & cast roundtable and Team Chewie! Solo: A Star Wars Story is now available on Digital HD and Blu-Ray! Solo: A Star Wars Story – Lightsaber Training with Ray Park + More!